The Season 4 fountain pen ink from Colorverse, Trailblazer in space is available in six new two packs. 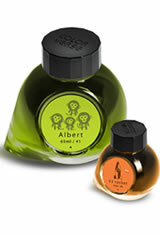 Each two pack of ink has a large 65ml bottle companioned with and a smaller 15ml bottle. The Colorverse Trailblazer in Space fountain pen inks pay homage to the trailblazers that paved the way for space exploration. The Colorverse Trailblazer in Space(65ml + 15ml) Fountain Pen Ink usually ships within 1 business day unless otherwise specified. Each Colorverse Trailblazer in Space(65ml + 15ml) Fountain Pen Ink we sell is guaranteed to be genuine, authentic and will arrive brand new & unused! Really liking the color and intensity of this ink. I’d describe it as being on the pink end of the red spectrum, and the shimmer is also subtle and has not been clogging up the medium point pen I’m using it in (a Pilot Vanishing Point).